I’ve been wanting to change my theme for a little while now, and finally settled on one – OfficeFolders 1.4 by Themocracy. 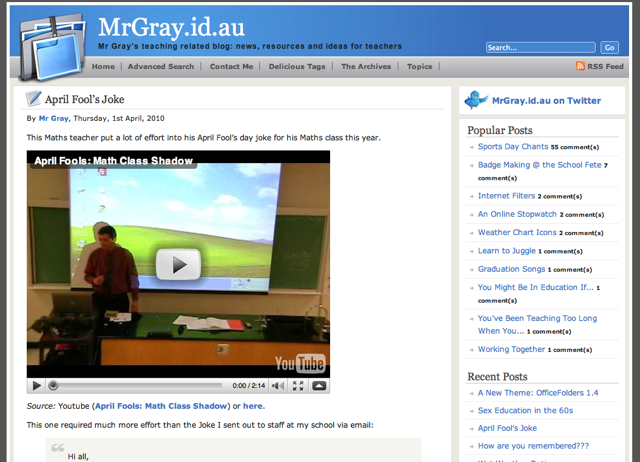 Be sure to let me know what you think of the new theme. I got tired of my old theme (Nikynik Blue), I thought it was starting to look a bit dated. 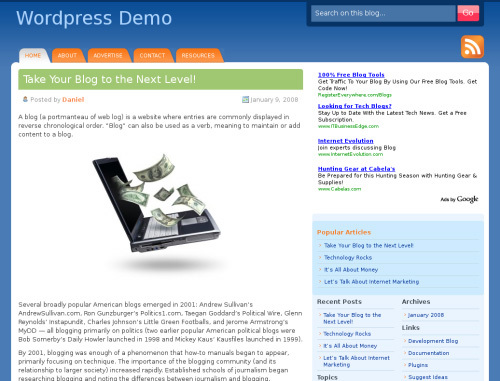 So I went looking for a new theme, still retaining the blue colour and came across Deep Blue WordPress Theme. The theme was created by Nathan Rice. Thanks Nathan. I have now installed the WP-DB-Backup Plugin (Version 2.1.2) from Filosofo. Installed in the regular directory and activated. Now accessed via Manage > Backup. Also installed this plugin – WordPress Plugins Tracker (Version 0.2), which immediately helped to show me that some of the plugins I am usingÂ are not the latest versions available. I have just installed a new plugin – Admin Drop Down Menu Version 2.2.1 from Yellow Swordfish. 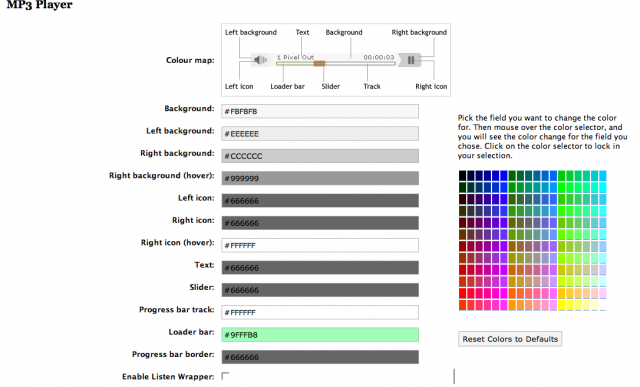 I have been using Planet Ozh’s plugin, but was finding that some of the menu had two many items, forcing them onto a new line, and making things look a bit untidy. I came across this new one, and as it has the menu in a vertical line, I shouldn’t run into that problem. 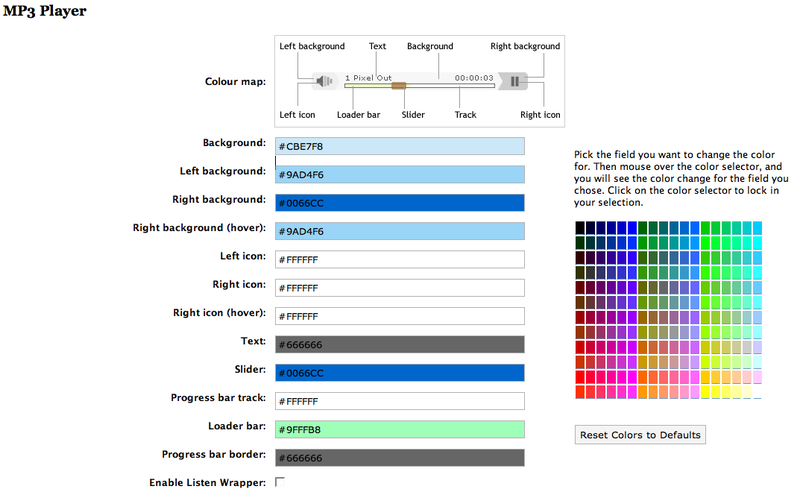 So over the past couple of days I have been working on adding some buttons to my sidebar. Of course, a Google search helped me with this. Taylor McKnight has a huge collection of badges available for download. So there you go, get busy putting up some badges. 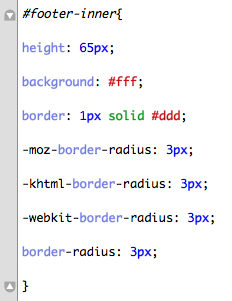 I recently discovered that it appeared there could be some CSS Class options available within the theme I was using. A bit of searching found this bit of information, which helped me work out how to get it working. around the text I want styled in that format (minus the spaces between the greater than and less than symbols, of course!). I can’t even remember where I first came across it – it might have been over at edublogs that I first saw it, but not real sure. 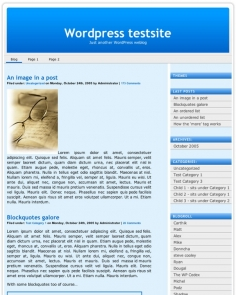 The WordPress Theme Viewer has it here. and after much searching, Nikynik has it on the Templates Page. I’m not yet sure how to use these though. Will need to look into it. Also, it should be noted that I have made a few little changes to the theme, mainly to accomodate some of the plugins I’m using (and I’ve described those changes in posts where I’ve written about the plugin!). 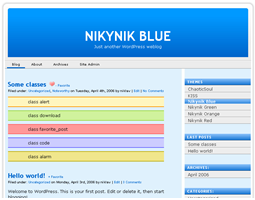 I haven’t come across any other sites using the nikynik blue theme (and surely there must be some, seeing as how great a theme it is), so if you are using the theme feel free to drop a comment, I’d love to check out your site. Again, thanks for the great theme, nikynik. Edit: I just found another link for nikynik over at WordPress.com, though not much there. Here it is. EDIT (Again!! ): Worked out how to use those Class Options. Wrote about it here. This site and this one helped me to work it out. I had to upload each of the files direct to the plugin directory, and activated it. Then inserted the new quicktag code on the Contact Me Page. Actually, I also found the intouch with subject plugin, which provides the same functionality but lets you insert a predefined subject, however it hasn’t been updated, and there was some talk about security issues in the earlier intouch plugin which this is based from. I have left a comment asking if this is going to be updated.